zarinahtakesapaycut: Will the Malaysian Institute of Accountants (MIA) take action on this? Will the Malaysian Institute of Accountants (MIA) take action on this? Will the MIA investigate the allegations against member no 2190, Chin Kwai Fatt, seen here unveiling a logo? 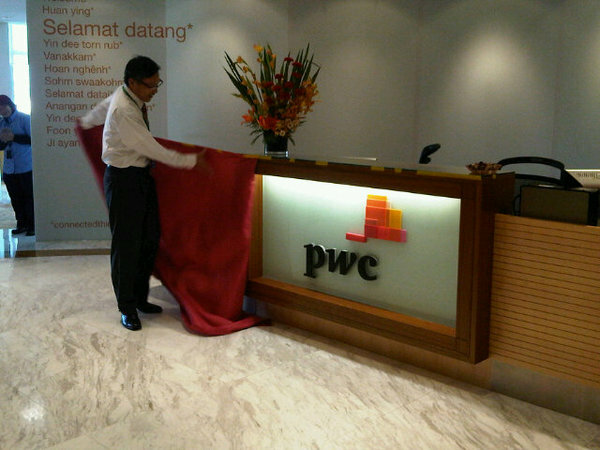 We said in this post and in the subsequent two, that the MD of PwC Malaysia signed a false declaration with regards to the firm known as PricewaterhouseCoopers Consulting Sdn Bhd (464379-U). We continue with further elements to the argument. Chin Kwai Fatt attested to the fact that PricewaterhouseCoopers Consulting Sdn Bhd (464379-U), in the year 2008 appeared to have been able to meet its liabilities as and when they fall due. Did Chin Kwai Fatt disclose the contingent liabilities that PricewaterhouseCoopers Consulting Sdn Bhd (464379-U) holds, arising from several lawsuits it faces in the courts, amounting to several hundred million Ringgit? Did Chin Kwai Fatt, as the Director of PricewaterhouseCoopers Consulting Sdn Bhd (464379-U), ensure that the company was able to pass the cash flow solvency test (an impossibility since the company ceased operations the following year) and the balance sheet solvency test, so that his declaration was valid? Can PricewaterhouseCoopers Consulting Sdn Bhd (464379-U), which has ceased operations (no more cash flow) and does not hold assets that are enough to meet its contingent liabilities (balance sheet solvency), meet its liabilities as defined by the Companies Commission of Malaysia (SSM)? The MIA has issued a circular to all its members, regarding Practice Note 1/2008 issued by the SSM. Members are hereby informed that the Companies Commission of Malaysia (SSM) has recently issued Practice Note No. 1/2008 on the requirements under Section 165 of the Companies Act 1965 (CA 1965) which relates to the lodgement of annual return with the Registrar of Companies (ROC). This practice note further emphasises the SSM’s stance for annual return to be lodged together with audited accounts. The lodgement of the annual return of a company shall be in accordance with the Eighth Schedule to the CA 1965 and be accompanied by such copies of documents as are required or such certificates or other particulars as prescribed in Part II of that Schedule. a copy of the auditor's report. the company is able to meet its liabilities as and when they fall due as at the date of the audited profit and loss account. In this regard, the practice adopted by some companies which lodge annual returns without attaching the audited accounts is not in accordance with the requirements of the CA 1965 as well as the principles of good corporate governance. Therefore, the lodgement of annual returns without the attachment as prescribed in Part II of Eighth Schedule as mentioned above will be considered as incomplete submission and will not be acceptable by ROC. The lodgement of annual returns with respect to AGMs held in the calendar year 2008 and thereafter would only be accepted for lodgement by ROC if they are accompanied with a copy of the relevant audited accounts or, where applicable, a duly signed certificate relating to exempt private company. Please take note that the complete set of Practice Note No 1/2008 is available at MIA website at www.mia.org.my under Technical / Areas / Corporate Law & Insolvency /Company Law. In 2009 the returns submitted by PricewaterhouseCoopers Consulting Sdn Bhd (464379-U), which can be viewed in its entirety here, does not meet the Practice 1/2008 of the SSM or the circular from MIA. The Chairman of the MIA Investigation Committee is Mr Kang Wei Geih, Billy, and its members are Uthaya Kumar a/l Vivekananda, Abraham Verghese, Datuk Mohd Nasir Bin Ahmad and Dr. Ku Nor Izah Ku Ismail. Uthaya Kumar a/l Vivekananda is the same VU Kumar who is a Senior Partner of PwC in Malaysia, so we ask him this once again : as a member of the MIA Investigation Committee, have you started your investigations on the many, many allegations raised here relating to your fellow senior partners yet? Will the MIA take action on the allegations here, or leave everything to Mr VU Kumar?